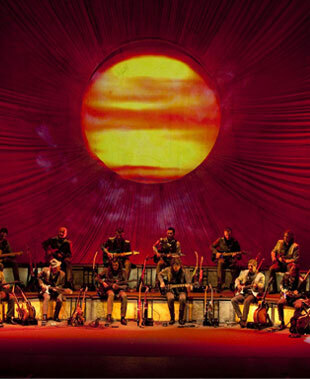 The ELECTRIC GUITAR ORCHESTRA (EGO) could only have emerged from Spain, the birthplace of so many great guitarists. EGO is the fruit of careful and constant research. A group of masters gathered together to perform classical music with electric guitars in a way they alone can do. From Bach to Holst, from Vivaldi to Falla. It is a staggering and thrilling experience. A world in which the music is always categorized as classical or popular. 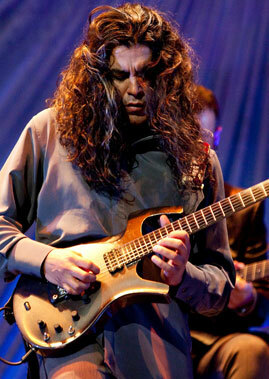 Pablo Salinas, musical director and creator of EGO, is a composer, guitarist, pianist, organist, arranger and producer with more than thirty years of professional experience. As a multifaceted, versatile, broad-minded artist, Pablo has always been open for collaboration with all kinds of musicians, styles and ways to make music. 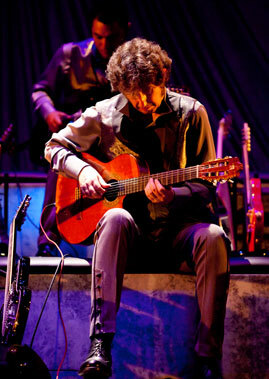 He has actively participated in countless album recordings and shared the stage with such big names as Mike Oldfield, Kevin Ayers, Ollie Halsall, Pino D'Angio, Jennifer Lopez, Enrique Morente, Joaquin Cortes, Joan Manuel Serrat, Miguel Rios, Ana Belen, Topo, Antonio Flores, Luz Casal, Rosario Flores, Golpes Bajos, Manolo Tena and so many others. "The breathtaking quality and the nonstop dramatic effects displayed by these musicians were beyond words [...]"
"We have no choice but to strongly recommend this orchestra. It really is a unique, top notch experience. We were truly excited. We foretell to them a bright future." "Musical performances are superb, delicate, inspiring. Some romantic, some exotic. Every member of the orchestra plays in a different way replicating the music of a violin, a piano or a flute." "Pablo Salinas acted as a rock band leader conducting eighteen good musicians who recreated the traditional orchestra's timbres and nuances with the electric guitar's diversity of amplifications and tonalities'[...]"